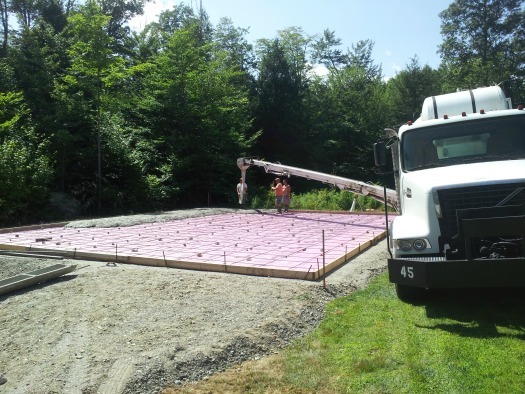 If you'd like a concrete basketball court in Maine, we've installed them with great success! 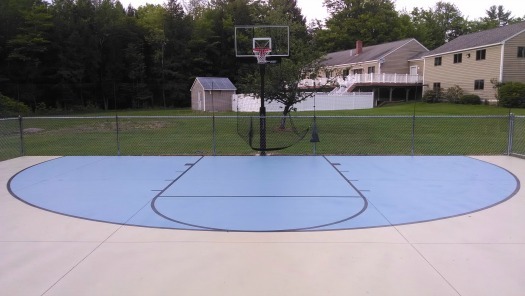 If installed properly, a concrete slab can be used for a basketball court and last for many years. Having an outdoor basketball court is a great place for the kids to practice their dribbling and shooting skills. I can remember, as a kid and loving the game of basketball, always being outdoors shooting hoops and playing basketball with my friends. 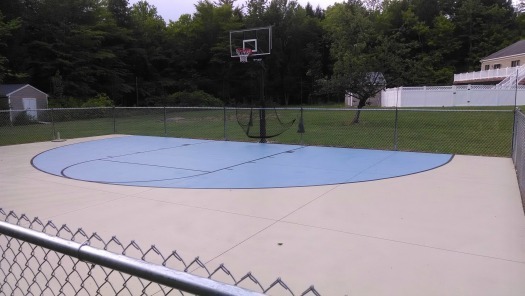 This is a concrete basketball court we installed in central Maine. It's a full size high school half-court. We installed the hoop, the 3-point line, the foul shot lines, and the color the surface. Below, I'll show you some of the steps we took when we installed the concrete for the basketball court. 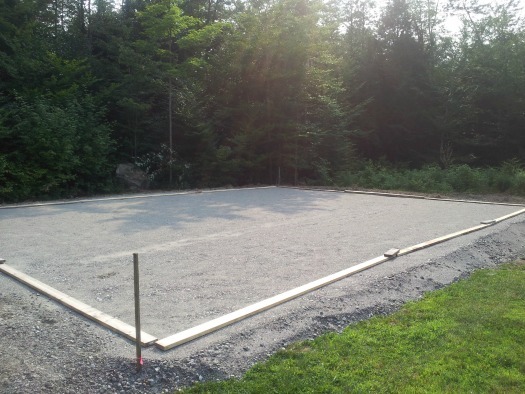 First, a gravel pad has to be installed. We don't do this part, you would have to hire an excavating contractor to do this. We could consult with them to let them know what we need to install the concrete pad. In this picture, there was 18" of gravel installed and compacted. We've laid out the forms to start forming the perimeter of the slab. Now we've got the court all formed with 2x6's and installed 1" styrofoam to help protect the gravel under the slab from freezing. 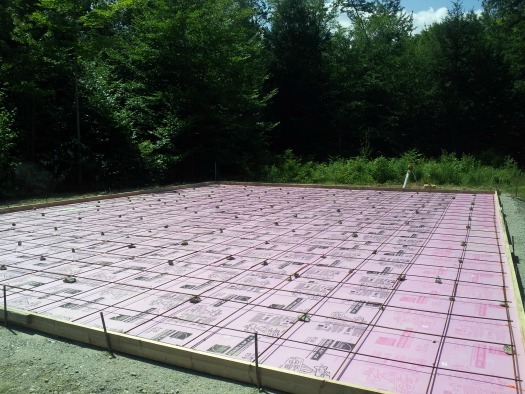 We also install a mat or rebar in the concrete for reinforcement. This concrete slab will be 5" thick. We're pouring the concrete for the basketball court. We used a conveyor truck to reach the bask because it was about 35' across. After pouring and leveling the concrete, we have to smooth the surface. We use a power trowel to do this. This is what the basketball court looks like when it's finished. Almost any color combination is possible to color the surface. We add a slip-resistant additive into the sealer so it's not too slippery. 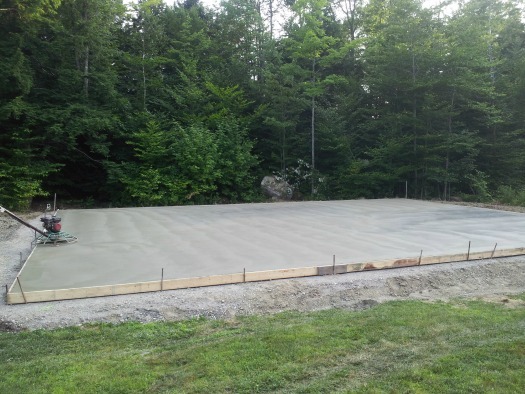 If you'd like an estimate for a concrete basketball court, you can click here. 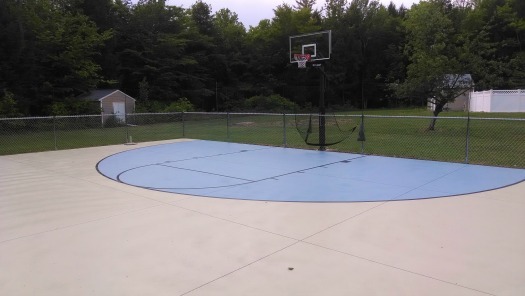 Having a backyard basketball court installed using concrete in central or southern Maine can last for many years if it's installed like this one.